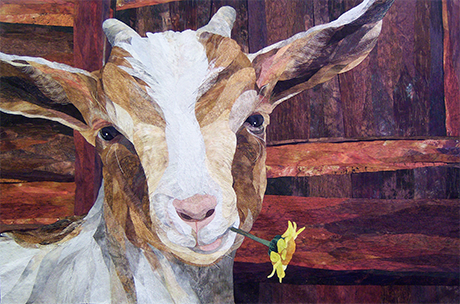 This lecture/demo-only class covers every step of David's process for creating appliqué art quilts that look like paintings using only fabric and thread. From pattern drawing to binding, every step is included. His technique requires only a love of fabric and quilting, and a willingness to spend months on the same project. The lecture is funny and informative. Studios may record and take photographs. A desire to learn and be entertained! David Taylor was born in Peterborough, New Hampshire, and currently resides in Henniker, New Hampshire. He has been the recipient of the Fairfield Master Award for Contemporary Quilting from the International Quilt Association (2006, 2014), the Brother Wall Machine Workmanship Award from the American Quilters Society (2008), and a two-time Best of Show winner at the IQA's Spring Festival in Chicago (2007, 2008), among others. His art quilts hang in numerous private collections worldwide.